At Universidad Nacional de Quilmes in Buenos Aires, Argentina, two students, along with the backing of their professors, elected to tackle a challenge that was affecting their visually impaired classmates: integrating screen readers with Smalltalk. For students Ángeles Tella Arena and Matias Melendi, the project was about ensuring that their blind classmates could interact with the tool in the same way as all of the other students. The Lazaro Project highlighted above, is one example of a university class project that was made into a promotional story. To view the full story, click here. 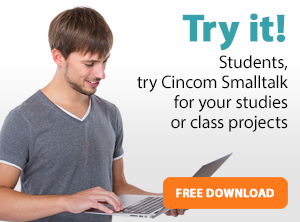 Have you created a class project using Cincom Smalltalk and want others to see your work? Fill in the survey below and let’s get started!